In the world of steel structure design, fabrication, and installation, it’s important to utilize the best approaches for each unique application to ensure long-term quality that will hold up through years of use. Modern structural steel fabrication has come to rely on the best practices and equipment for precise results that aim to exceed the industry’s stringent standards. Sanilac Steel is proud to be your go-to structural steel fabricators in Michigan since 1967, delivering comprehensive services to get your project completed on time and on budget. Our honest, reliable guidance focuses on providing you with the best production and safety practices in the industry. From the structural steel design process to mobile welding services and crane rentals, we have you covered! Part of our commitment to the community that we serve is education, which is why today’s piece will cover the key differences between TIG welding and MIG welding, including which approach is recommended for your application. If you are looking for the best steel fabrication companies in the state, be sure to reach out to the Sanilac team to learn more! There is often confusion between these two terms. Both approaches utilize electrical arcs to join metals together, and both rely on an inert gas combination to prevent welding electrode corrosion. While similar in use, each method provides different benefits for varying applications. Metal inert gas welding, or MIG, is a process that relies on feeding a metal wire into the metal to join a weld. This wire acts as a middle material to help bond the two surfaces together. Also known as Gas Metal Arc Welding (GMAW), this method is commonly deployed across construction sites of all types. Tungsten inert gas welding (TIG) relies on a tungsten electrode that is not consumed while the two metals are joined together. Metal fillers may be used for welding with Gas Tungsten Arc Welding (GTAW). While similar in design and application, TIG welding is inherently different from its counterpart. Each is deployed for different purposes, and can provide a wide range of advantages for your project. This method is often used for steel, but can also accommodate gold, bronze, brass, and aluminum metals. By relying on non-consumable tungsten, welders can expect a cleaner outcome that does not produce as much splatter, smoke, or waste. TIG welding also offers better temperature control, delivering more precision when it comes to creating high-quality welds for all materials. Because no filler material is used to bond the two surfaces, TIG welding relies on high temperatures on each piece to ensure a proper bond. The tungsten approach allows for more control, but only on thinner materials. Easy use and forgiving properties help to make MIG welding a popular choice for welders of all skill levels. The answer to this question depends on your site’s needs. TIG welding is a beneficial approach that can create beautiful, precise welds. 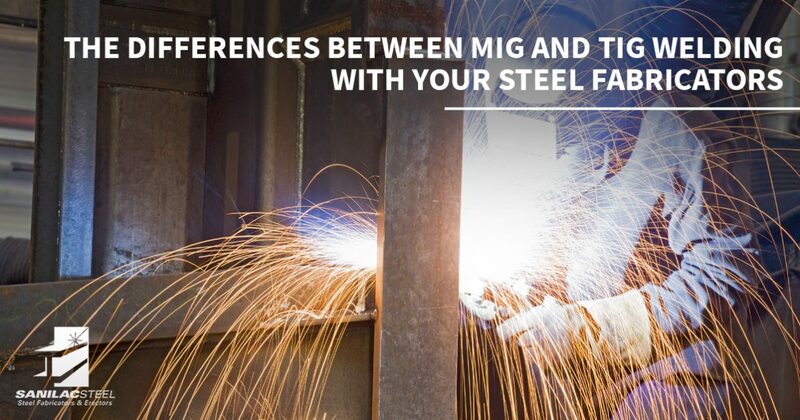 MIG welding is best used with heavier materials, delivering fast and efficient results. Tungsten welding can be very precise and effective, but only if you know how to get the job done right. In many cases, TIG welding sees the best results when used with robotic equipment and precision technology. In these cases, automated processes can help to make your steel fabrication process quicker and more cost-effective. For non-robotic applications, though, and for heavier uses, MIG welding is often the preferred method. While the welding method used in construction is important, the factors surrounding this technology can help to make or break the outcome of your project. It’s essential to find steel contractors who rely on reputation and proven practices to set the standard for a job. Our team is here to provide comprehensive support that improves the results of your project. Despite the content of this blog, it is important to remember that the best welding method for your metal applications will vary from project to project. One way to cut costs and protect yourself from setbacks is to work with a professional structural steel company for assistance. Sanilac Steel is proud to be your trusted team of structural steel fabricators in Michigan, delivering precise outcomes and beneficial guidance for each of our customers. We’re as dedicated to the quality outcome of your project as you are. To learn more about our safe and effective steel fabrication services, be sure to contact us today!